This group will put on a fully realized production of a musical, directed by Jessica McCuiston, to be performed at the end of the three-week session for family and friends. Each day students will have classes in Theater Games, Art, Voice, Acting and Dance with trained professionals and working artists. There will be opportunities to work on costumes, set pieces and programs. Students bring their own snack, lunch and dance shoes. Performances are the final 2 days during program hours. 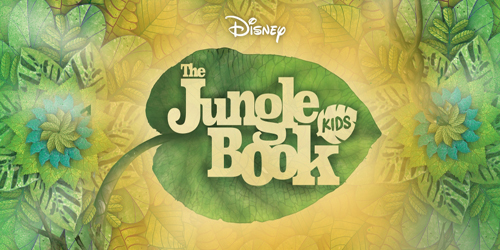 The jungle is jumpin’ with a jazzy beat in Disney’s The Jungle Book KIDS. Specially adapted from the classic Disney animated film, Disney’s The Jungle Book KIDS features a host of colorful characters and your favorite songs from the movie. Banished by the ferocious tiger, Shere Khan, a human boy named Mowgli and his panther friend, Bagheera, are on the run in the deepest parts of the jungle. On their journey, the two meet a sinister snake named Kaa, a herd of elephants and a giant bear named Baloo, who teaches them the swingin’ musical rhythms of the jungle. After surviving a dangerous encounter with a band of monkeys led by King Louie, Mowgli and Bagheera are forced to run for their lives. When Shere Khan returns, our heroes must rally their fellow animals and restore peace throughout the jungle. Deposit A nonrefundable deposit of $100 is due at registration. Cancellations We reserve the right to cancel any class that does not meet the enrollment requirements. Refunds Students who withdraw on or before June 1 receive a full refund minus the deposit. Students who withdraw between June 2 and June 21 receive a 50% refund. No refunds are given after June 22, regardless of attendance.